GORGEOUS BEACHFRONT, 3BR/2BA, WITH 110 FOOT SURROUND BALCONY! OUTRAGEOUS VIEWS! This Condo is located at the beautiful Seychelles Resort on the 20th floor. It has magnificent views of the sandy white beaches is located on the East end of Panama City Beach away from all of the bumper to bumper traffic- yet in the heart of the best restaurant, shopping and tourist attractions. It offers breathtaking sunsets and views of the coastline and the bays. The wrap around balcony will allow all of your senses to enjoy this oceanfront paradise. 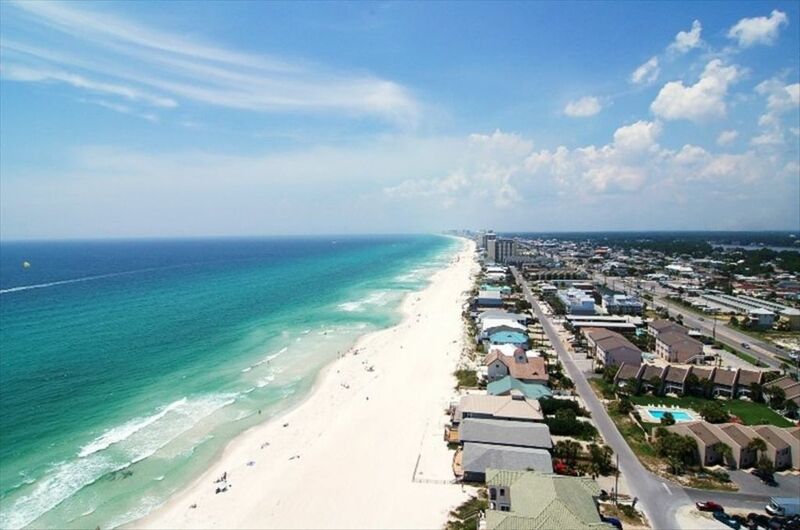 Unquestionably the best views in all of Panama City Beach. Local restaurants: Schooners, (next door), is the last local beach club is our famous family-oriented beach front restaurant with live music, dancing and major festivals. Captain Anderson's award winning seafood restaurant is one of many at the marina a couple blocks away. The marina is the destination for a vacation in Panama City Beach because some part of your stay here should include being on, in, around, above or under the water. Party boat, jet ski and other boat rentals. Cruises from swimming with the dolphins, sailing with pirates, dinner/dance, Shell Island excursions and more abound. Be sure to take in all three areas of the marina as each has unique offerings and friendly, helpful staff. This is the area in Panama City Beach to watch the daily catch as it is unloaded at the marina and visit the numerous fresh seafood shops. The Master bedroom has a king size bed with a door leading out to the balcony directly overlooking the beautiful Gulf of Mexico. Master bedroom has a TV/DVD combo for you viewing pleasure. The master bath is spacious with separate shower and tub. Second bedroom has a King bed, TV, DVD and sliding door leading out to balcony with spectacular views of the bay. This balcony wraps all the way around the west end of the building to connect with the beach front balcony. Third bedroom has two adults double bunks beds, TV, and DVD. The den/dining room opens onto the balcony and has 5 large picture windows on the west end of the building that allow a beautiful panoramic view of the Panama City Beach coastline from the entire living area. Sit anywhere in the main living area and view the most beautiful sunsets in the world. Kitchen is fully furnished with upgraded stained cabinets and stainless appliances including solid cook top with oven, refrigerator with ice-maker, dishwasher, microwave, coffee maker, blender, mixer and more. Laundry room, with large washer and dryer, is just off kitchen. You can also enjoy 2 beach front pools, 1 hot tub, game room and exercise room during your stay. St. Andrews State Park is within 1/2 mile and Schooners restaurant is just next door with its fabulous seafood menu. We take a personal interest in making your stay as enjoyable as possible. Contact us for any other information you need. Try us once and we are sure you will be back. It is hard to beat this combination!!! Keywords: Oceanfront with wraparound balcony. Master bedroom and den are gulf front. A family that was born and raised in Georgia and enjoyed many summer vacations on the Gulf of Mexcio decided to buy a home away from home that we could enjoy year round. We love the water, sand and just pure relaxation that comes from being here. Walking along the beach, playing in the sand with the kids, laying out at the pool, deep sea fishing, and just taking an afternoon nap have made some of our favorite memories each year. Jet sking in the bay is awesome and you never know what you may see while snorkeling at the jetties. Taking a relaxing pontoon boatride to Shell Island and stroll down the secluded beach looking for shells is the perfect place for a picnic. We often times see dolphin in the bay and enjoy when they come up to our boat for further inspection. We love the quiet end of the beach and the view off of the balcony sold us on this condo. The sunsets are spectacular. You can see for miles westward down the beach. Schooners next door is so great to order take out or walk to dinner, or just to walk in off the beach and order a cool refreshing drink. You have a front row seat for the annual lobster festival and 4th of July fireworks on the balcony. Watching the ships come in and out of the jetties are also wonderful. You will find no other place that beats the sunset at the end of a fun day at the beach. Without question this condo offers the best of best views of Panama City Beach, the gulf of Mexico and the area bays. Stunning water views in every room. A walk around balcony. The best restaurants in the area are located next door and nearby. Within walking distance of the state park and marina. There is everything to do and all is nearby. If you are looking for an upscale stay at a wonderful resort with fantastic views you have found your vacation spot with us. 2 full size bathrooms. Master has tub for two and glass shower. Second master is guest bath and also has private entry door to second master bedroom. Private resort with private beach. Bar service near beach, ski jets and rentals on site, walk to state park and marina. Parking is $20 per car for entire stay. Outrageous beach views in dining area. Spacious wrap-around balcony that is 100 feet in length. This is the most romantic getaway condo you will find in Panama City Beach. There is very nice dining and dancing next door and the walk around balcony is stunning. Families are also an excellent fit because of the location and fact there are water views in every room. That feature is unheard of in Panama City Beach. Well stocked condo that easily accommodated the 6 of us. Comfortable beds, beautiful views. Very comfortable, well laid out condo. Quieter end of the beach. This is one of my favorites and the view absolutely can't be beat. Would definitely stay here again!! Gorgeous Condo on a beautiful uncrowded beach! We had a wonderful week at this beautiful condo! The views are amazing! The condo is well stocked and the beds are very comfortable! There was plenty of room for our large family and the beaches were all that we could hope for! We had a air conditioning issue but Mike was great and took care of it right away! I would recommend this condo to anyone and we look forward to returning again next summer! Spent part of Spring Break with my 19, 17, 15 and 12 year olds. Perfect location, wonderful condo. Wish we could have stayed longer. We've stayed in PCB several times. This condo is our very favorite. Fully stocked, awesome - seriously awesome beach views, and the location is exactly what we wanted. Schooners is right next door and you won't find better food anywhere else. Fishing on the Jubilee was our family's favorite experience! Treasure Island fish market cleaned the fish we caught for next to nothing & we had everything we needed back at the condo to prepare fresh fish for our dinners. St. Andrews State Park is a nice walk down the beach and a wonderful place to spend a day. It was chilly during our stay but we still enjoyed sitting in the hot tub to watch the sunsets! We had a wonderful time and would love to stay there again! Beautifully decorated and clean facility. Gorgeous views!!! Convenient location! Rented this condo for a "Girls Trip" with my two friends. We thought the condo was wonderful! It is beautifully decorated; one of us even took pictures so we could mimic the decorations at home. The furniture was comfortable and well-suited for the space; the beds were even comfortable. The kitchen was well equipped with all the dishes & utensils that we needed. Schooner's next door is great for lunch, dinner, or drinks. Nearby Andy's Flour Power and Fatty Patty's was delicious for breakfasts. There is a Dollar General in easy walking distance for those last minute items you may forget to bring. Destin was an easy 45 minute drive for some outlet shopping. We did have a couple of problems during our stay but the owner's were prompt to respond and the maintenance person game quickly. (Problems were a slow drain in one of the bath tubs and none working Comcast box.) My only suggestion for improvement is for the owners to replace the shower curtain in the main bath (clean but had permanent stains) and supply little "hotel type" bars of bath soap in the bathrooms. Handsoap was provided as well as towels. Overall, the condo is great and I will definitely rent it again if I return to the Panama City area. Thanks Mike/BeachLovers! These were wonderful guests. They took ownership of the vacation rental and followed all recommendations. Their suggestions are spot on and we have implemented them. What was helpful for us was the feedback and ease of communications with this group. We have many return guests and hope to see these ladies again. There is no better location for varied activities, (marina, charters, site seeing, dolphins and pirates, party boats, dinner/dance cruises, state park, and the top restaurants in Panama City Beach. With Schooner's next door you have the best beach club, dining, dancing and festivals.